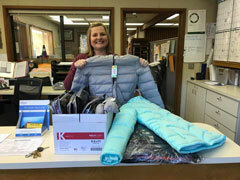 In an effort to provide new coats to El Dorado County students in need, EDCOE sponsored the 5th Annual Coat Drive. This program is a collaboration of EDCOE and district team members working hand-in-hand with schools to determine and fill the needs of our county’s students. Thank you to the dozens of generous EDCOE Team Members who contributed personal donations to the Annual EDCOE Coat Drive making this effort possible!